The widower of MP Jo Cox today urged society “not to fight with hate” as he prepared for the funeral of his wife. Family, friends and the constituents that the Batley and Spen MP served so passionately will pay their final respects as she is laid to rest today. A private funeral service for immediate family and a function for invited guests will take place after her funeral cortege slows in Heckmondwike and Batley to allow members of the public to mark her passing. The death of the 42-year-old mum-of-two shocked the nation on June 16. She was fatally shot and stabbed outside Birstall Library where she was hosting an advice surgery. The message came hours after a terror attack in the French city of Nice which killed 84 people, though Mr Cox did not specifically refer to the tragedy in the Tweet. This morning, mourners started to line the streets. Among them, carrying roses, were children from the choir at Norristhorpe School. They performed at a Batley event on what would have been Mrs Cox’s birthday and have sung on a charity single. Headteacher Claire Lyles said the school had hosted a special assembly for Mrs Cox after she had asked to see their choir perform. The children threw white roses ‎as the cortege passed through Heckmondwike. Kirklees Council leader David Sheard, who is also ward councillor for Heckmondwike, helped put up #lovelikejo posters last night. He said: “I haven’t been able to express myself at all. Myself and my wife went to school with Jo’s parents and when she came back she was a breath of fresh air. Mr Gallagher was one of several who had brought along a sunflower for the MP. He shared the horror and disbelief that many still feel about Mrs Cox’s murder. Sian Makepeace, 49, former owner of Batley’s Reunion Café, said: “I met Jo when she was campaigning to become the MP for this area and I would like to say we became quite close. Ahead of the funeral, Dan Jarvis, MP for Barnsley Central, has issued a poignant tribute to his dear friend Jo. He said: “Jo had an energy, passion and commitment to those she served that transcended party politics. Her life lived up to that ideal of speaking up for people who can’t speak up for themselves. Mrs Cox’s family has asked that they be allowed to grieve privately today, but were keen to ensure that residents are able to pay their respects. Her funeral cortege will tour her constituency from 10.30am, following a route along the A638 in Heckmondwike towards a slow-down point on Westgate/Market Street. The cortege will then continue towards Batley where shortly after there will be a further slow-down point on Market Place/Cambridge Street before it leaves Batley. A crowdfunding page raising funds for causes close to Jo’s heart has so far raised nearly £1.5million. Visit gofundme.com/jocox for details. Since Mrs Cox’s death calls have grown for a pensioner who came to her aid to be officially honoured. Former miner Bernard Kenny, 78, was released from hospital after he was stabbed in the abdomen trying to save the MP outside Birstall library. An inquest in Mrs Cox’s death was opened and adjourned last month after hearing she died from multiple stab and gunshot wounds. • Thomas Mair, 52, has appeared at the Old Bailey in central London charged with murdering Mrs Cox. 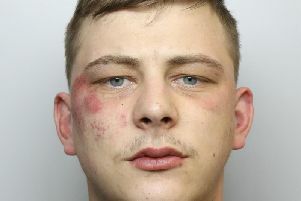 He is also charged with grievous bodily harm, possession of a firearm with intent to commit an indictable offence and possession of an offensive weapon. He is remanded in custody and due to go on trial in November.